PRINCETON, New Jersey (WABC) -- Police in New Jersey report that they have found the owner of a lost wedding ring. According to a Princeton Police Department Facebook post, the city's mayor helped solve the mystery. "We were contacted by our Mayor, Liz Lempert, who knew a Debbie and Jeremy that lived in town and it turned out that Jeremy was the owner. He was contacted and will pick the ring up. Thank you Mayor Lempert!" said the post. Princeton police said the wedding band was found on Nassau Street near Pine Street and turned in to the police department. 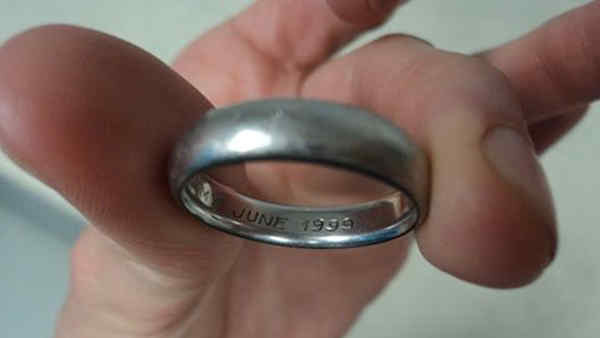 "Debbie and Jeremy June 1999" is inscribed on the inside of the band. Police used the ring's unique inscription and social media to help track down the owner.